As organizations strive to identify and realize the value in Big Data, many now seek more agile and capable analytic systems. While many have piloted Hadoop as a data repository for simple workloads, there is much more value that can be created from Hadoop by leveraging the data in the platform more, to interact with the data and uncover new business insights. • Best practice methods needed to extract value from Hadoop investments, analysing opportunities and obstacles many organizations face nowadays. • How to identify, validate and prioritise IT use cases based on value. • Why consumption based platforms are, in the current business world, the best of choice to overcome the risk of technology obsolescence. • Strategic guide to work with customer senior management and lead architects to address their architectural direction and alignment with business priorities. 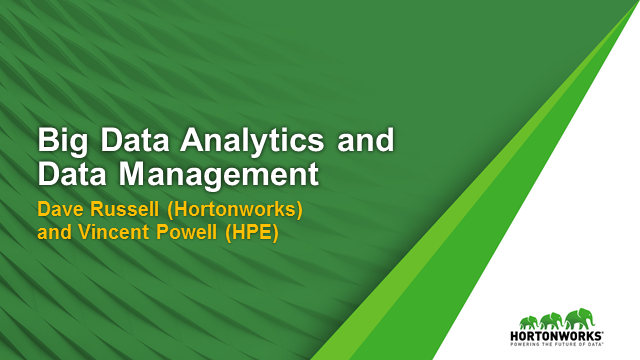 • Competitive information you need to craft the winning analytics strategy to derive real-time business insights from new and existing data sources.